Recent Peter Schiff gold forecasts predict the metal's rapid rise to a five-figure price tag -$13,000 long term, according to his gold investing blog. Schiff says the gold-price driver will be a hyperinflationary episode brought on by easy money. Peter Schiff gold price predictions like this are typically predicated on gloom-and-doom forecasts of a dollar collapse and a financial meltdown. This take on gold investing tends to attract skeptics. The gold skeptics are so dead-set on discrediting this caricature of gold investing – brought on by the Peter Schiff gold investing thesis – that they write gold off altogether as an asset for the paranoid investor. This polarizes the investing world between gold bugs who think an economic collapse is imminent and gold bears who think the gold bugs are scare-mongering demagogues. The truth about why gold matters lies somewhere in between. 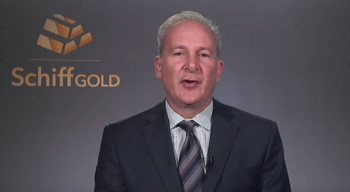 You don't have to agree 100% with Peter Schiff gold predictions to appreciate the yellow metal's value. Regardless of which "side" you're on, gold is an important part of a portfolio. A typical Peter Schiff gold forecast points to mounting government debt and "money printing" as evidence that someday, the fiat money system will be upended. At that point, people will pour into gold to stave off the rapid deceleration of the U.S. dollar's value. A skeptic's typical Peter Schiff gold rebuttal will consist of questioning why, after U.S. debt has reached $18.3 trillion and the U.S. Federal Reserve has pumped $2.4 trillion in the banking system through three rounds of quantitative easing, the dollar is still stronger than it's been in recent history. Quantitative easing is the process by which the Fed buys bank assets and credits them with newly created reserves in an attempt to bring down interest rates. But QE by itself is not an inflationary policy. The reason why inflation, or hyperinflation for that matter, hasn't happened yet is that the U.S. economy hasn't entirely shrugged off the effects of a so-called "balance sheet recession." In a balance sheet recession, households and firms use extra money to pay down debt, as opposed to making purchases on consumer goods. The classic definition of inflation as "too many dollars chasing too few goods" breaks down when the economy is not "chasing goods." Instead it's redirecting that money to reduce debt. When there simply isn't enough economic activity and consumer loan demand is stifled, no amount of quantitative easing or government spending is going to get money moving around in a way that stokes inflation/hyperinflation. Why do i get the feeling that Schiff is merely one of those people who says the same things over and over until, with enough time, the things they predict come true (due to boom & busts) and then people go crazy about how he was so accurate. Well he's not accurate. He's been saying this about Gold for years and listening to his advice would have been horrible. It is no different than his predictions about the economy collapsing for years and year until finally in 2008, he looked like Nostradamus – that is, if you ignored that he had been wrong for all the prior years. I have no doubt that sometime in the future Gold will be worth a lot more than it is today. But Schiff is merely just a broken clock, that he may be right someday says nothing about his forecasts. That he's held in any esteem as a result says everything about the people that buy into such nonsense. You don't just 'get that feeling', you are repeating something that others have said and passing it off as your own thought. Your comment shows such an amazing ignorance in our "bubble economy" that it borders on criminal. Schiff and others are not trying to time the market bubbles, but rather, tell people that they exist. Those who live in the "ignorance bubble" try to tell people that everything is great and economic bubbles don't exist. These people need to only watch the "Walking Dead" and avoid all TV programs that are related to money and the economy.